Natarajan Venkatakrishnan (Venkat) is the Director of Research & Development for GE Appliances, since 2006. 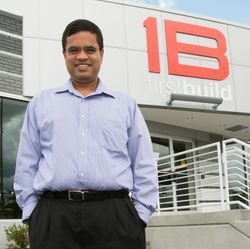 He also leads FirstBuild, an open source micro-manufacturing to create a new world of home appliances. He has more than 25 patent filings to date. Education: B.Tech degree in Aerospace Engineering from Indian Institute of Technology, Chennai, India. Family: Wife Chitra, have two children. On the board of the Louisville Regional Science & Engineering Fair, Dupont Manual Science Fair and the Kentucky Statewide EPSCoR Committee. Founder, Chief Executive Officer, President and Chief Architect, Vistex, Inc. Vistex is estimated to be valued at US$200 Million. Has homes in Germany and India and recently bought a a penthouse on 89th floor at the Trump Tower in Chicago, US for $17 Million from Donald Trump. Sanjay Shah worked at Accounting and Logistics roles before joining SAP as an Applications Consultant in 1993. At SAP he worked for 6 years as a Platinum Consultant and Logistics Developer and contributed to over 80 SAP projects.